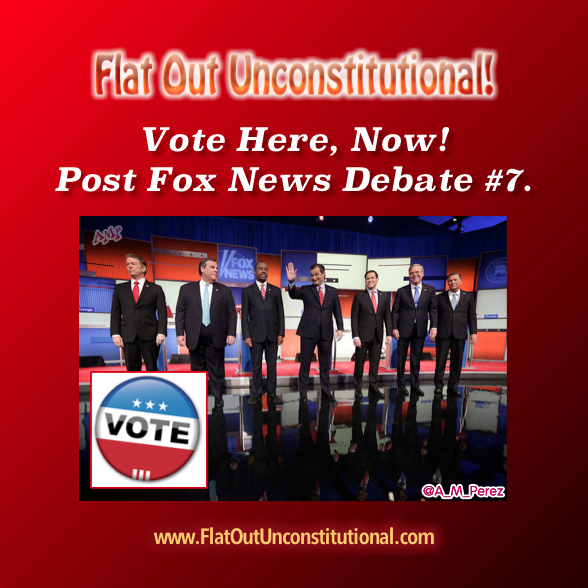 GOP Primary Poll – Post Debate #7! These are only candidates that were eligible for the Fox News Top Tier Debate, whether they showed up or not. After voting click the Home button on top! Previous Republican Debate 7 Synopsis! Online polls are interesting to watch, but I don’t take them too seriously, because I think a lot of them are spammed by supporters of various candidates. The other day I saw a poll that asked people who had supported Ron Paul in the last election who they liked this time around. One candidate was polling far ahead of the rest, like Rand Paul is on this site. Who was that candidate? Bernie Sanders! Now I have to ask, what do Paul and Sanders have in common? People scare me. Oh look at the Rand fans spamming the poll just like his crazy daddy’s fans did! It’s idiots like you who keep picking the the RINO’s. Lets see how good you do this time.